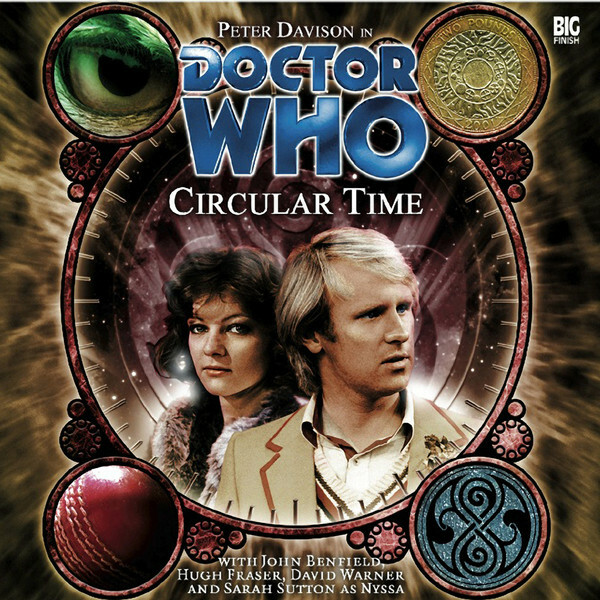 ‘Circular Time’ is something of an experiment for Big Finish, a compilation of four unrelated stories featuring the Doctor and Nyssa that explores different aspects of time. Spring– The Time Lord Cardinal Zero has decided to retire from Gallifrey, taking up residence on a rainforest planet with a dominant avian species, one for which he as great plans. The Doctor arrives to ensure that Cardinal Zero does not interfere with the timelines, and Nyssa is distressed to find that this species’s form of justice involves punishing the youngest member of the criminal’s family. This is a very straightforward story, and due to the brevity of the running time some of the Doctor’s actions seem a little contrived to suit narrative purposes and Zero’s plans and also to help the resolution. Regardless, Hugh Fraser is absolutely delightful as an arrogant Time Lord who firmly believes that he knows what is best for the avian people, wanting to become the Prophet of legend by bringing about a radical change that will bring them out of their barbaric traditions that time has ingrained into their society. Summer– ‘Summer’ is possible the most direct and accessible of the stories included in the set, the Doctor and Nyssa finding themselves locked in the Tower of London in the seventeenth century after future and alien currency the Doctor possesses is deemed a forgery. Sir Isaac Newton, played superbly by David Warner who manages to encapsulate the intelligence and ego of the character perfectly, realizes that the Doctor is something more than a petty criminal. Indeed, despite how well Davison and Sutton work together, Warner truly steals the show, and Newton is able to piece together that the British empire will crumble and that Earth will be invaded in the twenty-second century simply from the currency the Doctor holds. It’s a nice piece of work buoyed by strong acting as Newton realizes that his name will ultimately be forgotten. Ultimately, Summer is a tale about using the past to define the future, and the strong performances help make this straightforward tale much more powerful. Autumn– ‘Autumn’ starts out harmlessly enough as the Doctor tries to help the Stockbridge cricket team avoid relegation, though the separation he maintains between himself and his teammates is the source of mild consternation. Still, the Doctor portrays a man who tries to avoid attachments while helping out people quite well, a more mild depiction of his usual actions but on a much more intimate scale. At the same time, Nyssa is using the break in travel to novelize her feelings about the destruction of Traken, and it is Nyssa who truly takes centre stage here, finding it difficult to cope with the advances of Andrew on top of her inability to actually write down her thoughts. Nyssa slowly revealing her past and her alien nature to Andrew is quite well done, as is her coming to terms with the events on Traken and deciding to continue on with the Doctor. Winter– Winter sees the Doctor and his wife Anima living through a brutal winter on their farm with their children Tegan and Adric. Meanwhile, Nyssa tells her husband Lasarti of her dreams about the Doctor, believing he is asking her for help despite having parted ways with her years previously. Using her husband’s machine that lets a person interact with his or her own dreams, Nyssa meets up with the Doctor once again and, as he slowly begins to remember who she is, the banging of the barn door slowly takes on an ominously familiar laughing sound. In fact, all of ‘Winter’ takes place during the Doctor’s regeneration due to Spectrox toxaemia, explaining the traumatic process in great detail as well as the presence of his companions and the Master in his mind on screen. Davison is superb as a man trying to hold on to accept the new beginning while also wearily confronting the fact that his own time has reached its end, and the mental component of the Fifth Doctor’s regeneration is brought to much fuller life wonderfully. The short running times of the individual stories, of course, mean that some aspects aren’t as fully fleshed out as in a feature-length story, and some of the less grandiose moments of the Doctor’s lives may not engross listeners as much as other stories, but each of the tales offers an intriguing look into the Doctor’s life while also allowing exploration of the Doctor and Nyssa in a much more personal manner than most.